Download and Install Duplicate Sweeper. Start up Duplicate Sweeper by double-clicking the Duplicate Sweeper icon on your desktop. Choose which folders you'd like Duplicate Sweeper to scan, then click "Start Duplicate Search". 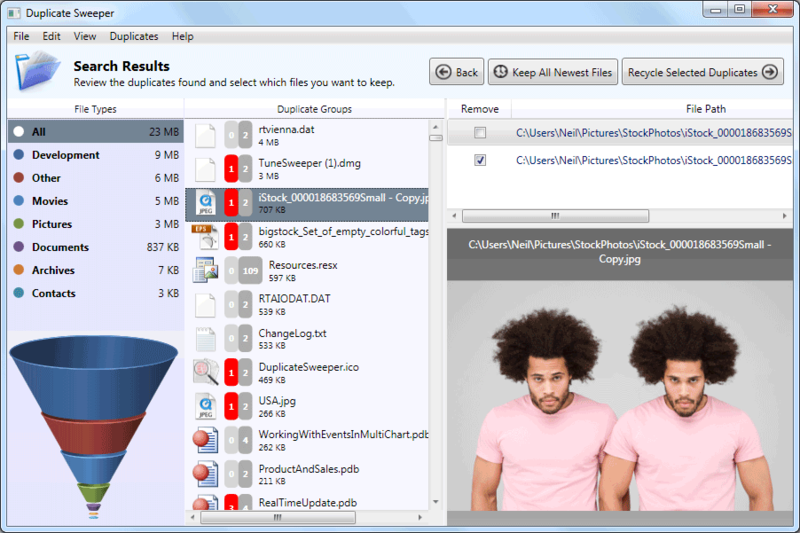 Select which files to remove, or let Duplicate Sweeper do it for you automatically. When you're happy with your selection, click "Recycle Duplicates" (PC) or "Trash Selection" (Mac). Confirm the delete. Files will be sent to Recycle Bin or Trash Can. You'll firstly need to tell Duplicate Sweeper which folders from your computer to scan for duplicates. Once they're selected, click "Start Duplicate Search". When the scan is complete, Duplicate Sweeper will list all of your duplicate files found in the folders that you specified. Under the "Duplicate Groups" header, you'll see a list of files which have duplicates. The number in the grey box next to a file indicates the number of duplicate files in the group. Clicking on a duplicate group will show each file and it's file path. Next, you'll need to decide which files to remove from each duplicate group. You can do this manually by clicking a duplicate group, then checking the Remove box next to a duplicate files you wish to remove. Alternatively, you can save time by letting Duplicate Sweeper do the work. To do this, click the "Duplicates" tab in the toolbar, and choose either "Keep Newest Files" or "Keep Oldest Files". When duplicates have been selected and ready to remove, the number of duplicates that will be removed from each duplicate group will be shown in a red box. Once you are satisfied with your selection, click Recycle Selected Duplicates. Then, confirm to proceed to recycle all of the Duplicates. Find more information on how to select and remove duplicates from your computer. The files you recycle will remain in the recycle bin (PC) or trash can (Mac) until you choose to empty it, should you decide to change your mind.